There’s been a lot of trash talk this week from the Denver Broncos team as well as their fans. I decided to go inside the minds of two die-hard Broncos fans to see what all the hate is about. After searching words like “Belicheat” and “Cheatriots” on Twitter, I came across @Mojoscorpio and @CoachGrismack. @Mojoscorpio is a classic Patriots hater, but he’s not an idiot. He grew up in Denver and bleeds Bronco orange. He obviously knows his football, although he lost me a little saying that Brady should have admitted to something that he didn’t do. Regardless, he was respectful and I appreciate his honest and thorough answers. @CoachGrismack has been a Bronco fan since ’78. He dislikes the Patriots, but doesn’t go as far as to say that he hates them and even said that he would hang out with Bill Belichick and Tom Brady given the chance, so he seems pretty cool. He does hate Bill’s snarkiness though. 1. Who is your pick to win the AFC Championship? @Mojoscorpio – My pick for the game is Denver. Denver is the underdog for good reason but it feels like they need it more. Home field will be a big factor. If this was in NE it would be a different story. 2. What advantages do the Broncos have over the Patriots? @Mojoscorpio – The advantage Denver has is just hunger. The teams are fairly even. If the Pats are a little better the home field evens it out. The deciding factor will be desire. The Ravens loss from years ago still lingers. The Super Bowl loss stings. The Colts loss last year was just pathetic. These guys have worked hard. They truly like eachother. Feels like a family all focused on the same prize. 3. Why are the Patriots and their fans hated so much outside of New England? @Mojoscorpio – I think Pats fans are disliked because of a few factors. Any successful team will have haters. They are a fairly new fan base. You couldn’t find a Pats fan 20-25 years ago. 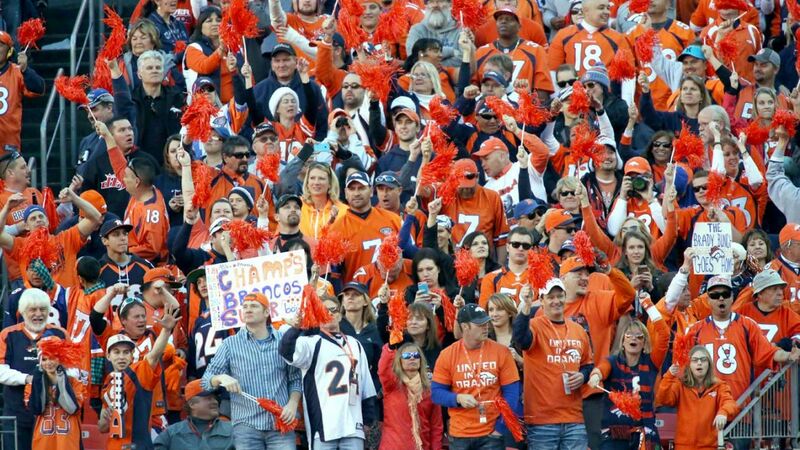 Broncos fans have been around since the 70s and have a great history of suffering. Pats fans never endured the suffering, they just reaped the rewards. Factor in Toms pretty boy looks and cheating allegations and you have the perfect villian. Eveyone is the underdog to the Pats. People love the underdog. @CoachGrismack – Patriots are hated because for whatever reason people like to hate greatness. I liken it to when the Yankees were dominant in baseball. With that said, I also think that they’ve been caught cheating multiple times Billy’s attitude and the snarkiness I suppose but Tom really creates a dislike for people who arent fans of the patriots. Now I will say this, I may dislike them mostly for their attitude however I do respect the hell out of them. 4. Do you consider Tom Brady and Bill Belichick to be cheaters? Why or why not? @Mojoscorpio – Bill and Tom are so competitive and so used to success that I wouldn’t put anything past them. I believe they have crossed some lines. Why did Tom destroy his cell phone? Why did the league destroy the spygate evidence? Too suspicious. @CoachGrismack – Yes they are cheaters simply because they’ve been caught. Is that to say that other teams in the NFL are or are not doing it? no. I always compare it it to Bill Clinton in the fact that other presidents were probably doing the same thing, he just got caught. 5. If so, do you think their four rings tainted? @Mojoscorpio – Are the rings tainted? Only time will tell. I will always bring that up in discussing great teams of the NFL. I think the Steelers of the 70s used steroids. Does anyone mention that when talking about them? Only educated fans. The rings are tarnished at this time but we always romanticize the past. @CoachGrismack – No their rings are not tainted it’s still have to perform on the field regardless of what goes on off the field. @Mojoscorpio – Peytons HGH story is far too vague to pass judgement yet. It doesn’t seem like something in his character. He would be disappointing his father and brothers, which I feel is far too important to him. I also believe he considers his legacy in every decision he makes. It would destroy all that he has worked for. Doesn’t make sense. @CoachGrismack – If Peyton use HGH from that place it wouldn’t be a very good advertisement for HGH from that place. He obviously doesn’t have the body of somebody who has used HGH. Yeah it’s it’s more the fact that he was there and I think it says a lot that the Al Jazeera is now out of business. 7. The Broncos were fined almost $2 million and lost draft picks for circumventing the salary cap between 1996 and 1998 to pay $29 million to John Elway and Terrell Davis. Does this mean that Denver’s Super Bowls in 1997 and 1998 are tainted? @Mojoscorpio – The Broncos admitted wrong doing and paid the consequences for the cap violations. This is a big difference. If deflategate had been admitted to it wouldn’t be a big deal. Plus, Denvers violation didn’t have any impact on the game on the field. They would have found a way to pay those guys regardless. If they had lost it would be a moot point. 8. Is Tom Brady a hall of famer? Will he go down as one of the best QB’s of all-time? Is he better than Peyton? @Mojoscorpio – Of course Brady is a hall of famer. One of the top QBs ever. That conversation always comes down to preference. No way to prove who is best. Each team is different. Is Marino terrible for not winning a ring? Not at all. Brady has been very fortunate (see tuck rule) but he isn’t my top QB choice. Is he better than Peyton? Truth is, no one knows the answer to that. Keep in mind Broncos fans disliked Colt Peyton for years. But he was scary as hell in his prime. #7 will always be #1 around here. 9. What do you think about Brady and Manning’s close friendship off the field? @Mojoscorpio – Brady and Manning share a brotherhood that few can relate to. Playing QB in the NFL is what we all dream of. To do it successfully is a fraternity not many will ever know. I understand the friendship. I have no problems with it. @CoachGrismack – I think it’s great that Tom and Peyton get get along off the field. I think it will help the grow the game among the younger quarterback. 10. Do you personally hate the Patriots? @Mojoscorpio – I hate the Pats. I grew up in Denver hating the Raiders. We had no baseball team so I cheered for the aweful Yankees because I liked Donny Baseball. So I hate the Red Sox too. Thousands of Bostonians have moved to my city bringing thier loud proud attitude with no respect for the history of Denver sports or the fans. The only thing we have in common is Ray Bourque. @CoachGrismack – Well I don’t personally hate anybody especially when it comes to what I would consider to be a form of entertainment. No do I respect the patriots? Of course. Do I like the snarkiness Billy? No absolutely not. Do I like the fact that Tom appears to be a big crybaby on the field? No I don’t. When I hang out with either of them if given the opportunity? absolutely! Thanks to @Mojoscorpio and @CoachGrismack for their participation. Go Pats!